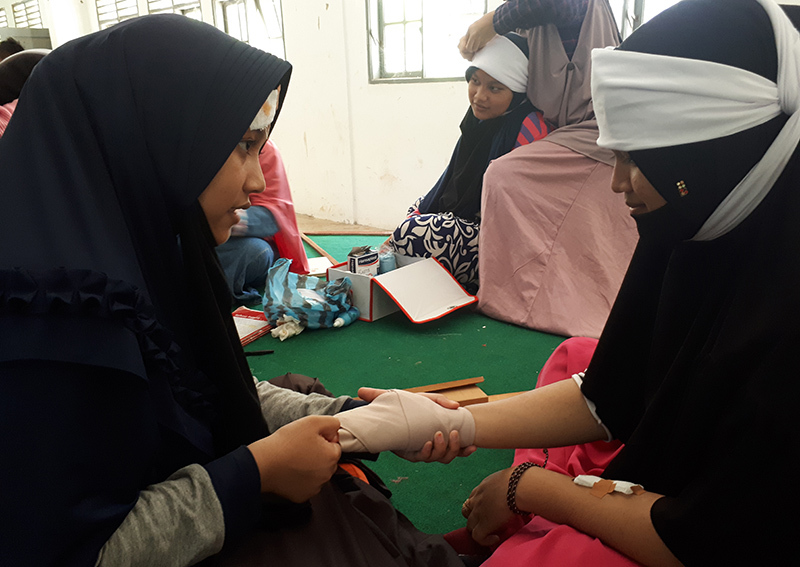 Five Unsyiah students from two different faculties hold first aid socialization for pesantren student (SADAR). The five students are Ahsana Nadya, Jeni Elvania, Zulfia Risda from the Faculty of Nursing. While Yasarah, Imam Maulana from the Faculty of Medicine Unsyiah. They are incorporated in the Student Creativity Program Team of Community Service (PKM-M), which is guided by Ners Noraliyatun Jannah, M.Kep. Iman Maulana, one of the team members, said the event took place at Dayah Markaz Al-Ishlah Al-Aziziyah, Banda Aceh City. This activity has been going on since April and will end in July. Imam added that this activity focuses on socialization and first aid training in the event of an accident. The students are also trained skills for first aid in times of injury, such as burns, sprains, nosebleeds, fainting, to fractures. "Usually whenever there is injury, the students immediately taken to the health center, but the incident can still be handled first," said Imam. He said this activity aims to form an organizational system like the Student Health Unit (UKS). It is hoped that the presence of this system can foster knowledge and awareness of the students about the first aid. At the end of the activity, the students were also involved in the first aid simulation during the disaster.